Borde Hill Garden will celebrate its 125th anniversary in 2018 with a programme of events which highlight the horticultural importance of this historical Garden. In 2018, a special programme of events will mark the 125th anniversary of the Stephenson Clarke family residing at Borde Hill. The programme will include the unveiling of a new 'Magnolia Grove' in March, boasting 48 specimen trees and 20 birches. What's more, groups will be able to book early-spring tours of Borde Hill's renowned magnolia and camellia collections. The celebrations continue into the summer with two weeks of Rose Celebrations in June, during which the Rose Garden delivers stunning colour and scent from 700 David Austin roses. Weekday tours of the Elizabethan House will also be available between 18th and 29th June. Specialist rose gifts and plants will be for sale in the gift shop. In July, the Elizabethan House will provide a dramatic setting for an open-air opera programme delivered by Opera Brava. A special celebration on 1st July will see an elegant High Tea accompanied by excerpts of opera being performed live. 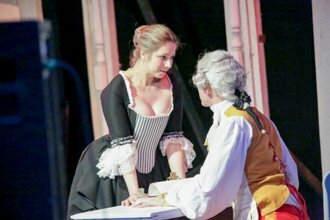 Later the same month there will be performance of La Boheme and The Marriage of Figaro on the 27th and 28th July. The musical theme continues every Sunday in August, between 1.00 and 3.00pm, when a different act will serenade visitors during 'Musical Picnics'. Groups are invited to book a guided tour of the Garden, where they will be shown the new 'Magnolia Grove, the planting of thousands of bulbs in the Italian Garden, and the many herbaceous plants in Paradise Walk. Borde Hill also has a wonderful gift shop, plant nursery, two cafes, a restaurant and the Green Tree Gallery, ensuring there is plenty to enjoy. The Garden will be open until 5pm across the season, March to October. 18 - 29 June - Rose Celebration Weeks. Join us to celebrate the beauty of the rose, with short tours of the Rose Garden and surrounding borders at 12noon on 20th and 27th June (free of charge). Don't forget to visit the shop for specialist rose plants and gifts for sale. 18 - 22 & 25 - 29 June - 125th Anniversary Celebration: Guided Tours of the Elizabethan Mansion House. We are delighted to offer visitors the annual opportunity to enjoy a guided tour of the Elizabethan Mansion, home to the Stephenson Clarke family for over a century. Tours at 12noon and 2pm. Tickets: £4 (limited availability and tickets cannot be booked in advance). 5, 12, 19 & 26 Aug - Musical Picnics. Every Sunday in August between 1 and 3pm you can enjoy relaxing live music on the Azalea Ring. Bring a picnic, kick back and let the music wash over you. 16 September - Specialist Plant Fair. A wide range of locally grown, garden worthy and unusual plants that will inspire keen gardeners. The information is correct at the time of going to print and is subject to change at any time.